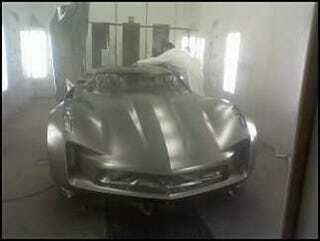 Last time we saw it from afar, but now we've got the first close-up shot of what we're now told is a Corvette concept shot on the set of the new Transformers 2 movie, Revenge of the Fallen. The latest shot, posted to the Motown Muscle forum, comes with some degree of reliability given it comes with two new shots of the "Bumblebee" version of the 2010 Chevy Camaro Z28. That's right, our e-mail tipster, who also posted the shots on the forum, claims not only that this is a 2010 (or 2012) Corvette concept, but also that this isn't the "SS" Camaro, it's the Z28. Whether this mean we'd not only get a "Super Sport" package, but also a "special performance package" via a Z28 check box remains to be seen. UPDATE: We've also been told it may just be a package we can order from the folks at Saleen. But, we digress — if we're to believe the poster, both vehicles are getting some sort of paint treatment as part of work they're undergoing at the hands of Chip Foose. How the producers of the new Transformers 2 movie got Foose to step away from his work on "Foosical: The Musical" we'll never know. Hit the jump for the Camaro shots and some of our own speculation. So we're starting to think GM's decided the auto show scene isn't where they're going to capture the next generation of car lovers. Instead, they're decided — why not take the show to the people by way of the silver screen? UPDATE 2: That front end really has a very distinctly distended fourth-gen Camaro vibe to it...old Camaro concept perhaps? Does Bumblebee go bad for a short time in the movie? Just some more speculation on my part.